The capture and storage of CO2 from combustion of fossil fuels is gaining attraction as a means to deal with climate change. CO2 emissions from biomass conversion processes can also be captured. If that is done, biomass energy with CO2 capture and storage (BECS) would become a technology that removes CO2 from the atmosphere and at the same time deliver CO2-neutral energy carriers (heat, electricity or hydrogen) to society. Here we present estimates of the costs and conversion efficiency of electricity, hydrogen and heat generation from fossil fuels and biomass with CO2 capture and storage. We then insert these technology characteristics into a global energy and transportation model (GET 5.0), and calculate costs of stabilizing atmospheric CO2 concentration at 350 and 450 ppm. We find that carbon capture and storage technologies applied to fossil fuels have the potential to reduce the cost of meeting the 350 ppm stabilisation targets by 50% compared to a case where these technologies are not available and by 80% when BECS is allowed. For the 450 ppm scenario, the reduction in costs is 40 and 42%, respectively. Thus, the difference in costs between cases where BECS technologies are allowed and where they are not is marginal for the 450 ppm stabilization target. It is for very low stabilization targets that negative emissions become warranted, and this makes BECS more valuable than in cases with higher stabilization targets. Systematic and stochastic sensitivity analysis is performed. Finally, BECS opens up the possibility to remove CO2 from the atmosphere. But this option should not be seen as an argument in favour of doing nothing about the climate problem now and then switching on this technology if climate change turns out to be a significant problem. It is not likely that BECS can be initiated sufficiently rapidly at a sufficient scale to follow this path to avoiding abrupt and serious climate changes if that would happen. 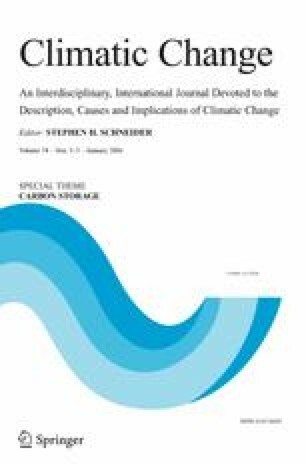 Azar, C., Lindgren, K., and Persson, T.: 2001, ‘Carbon sequestration from fossil fuels and biomass – Long-term potentials,’ in Lygnfelt, A., et al., 2001, proceedings from carbon sequestration symposium at Chalmers Oct 26, 2001. Available at http://www.entek.chalmers.se/∼anly/symp/symp2001.html. Freund, P. and Davison, J.: 2002, ‘General overview of costs,’ Paper Presented at an IPCC Workshop on Carbon Capture and Storage on November 18–21, 2002, Regina, Canada (http://www.nrcan.gc.ca/es/etb/cetc/combustion/co2network/htmldocs/inter_link_iea_ipcc_e.html).